Merrill Hart is a Certified Physician Assistant by the National Commission on Certification of Physician Assistants (NCCPA). 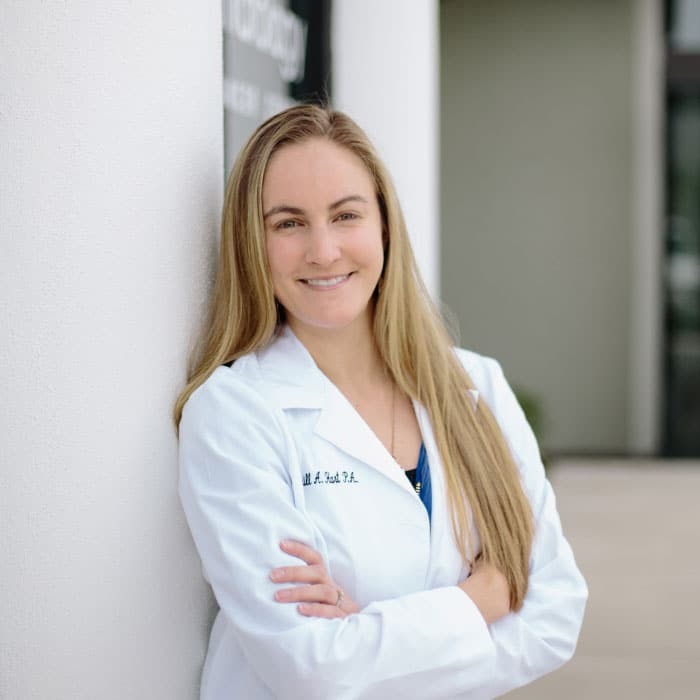 She started with the practice in January 2016 after earning a Master of Clinical Medical Science from Barry University’s Physician Assistant program in 2015. She earned her Bachelor of Science degree in 2011 from University of South Florida. She a professional member of the American Academy of Physician Assistants, Florida Academy of Physician Assistants, Society of Dermatology Physician Assistants, and Florida Society of Dermatology Physician Assistants. Merrill enjoys dermatology practice as an opportunity to educate patients about overall skin care, along with skin cancer awareness, prevention, and early detection. Outside of work, Merrill enjoys spending time with her husband and their two dogs. Other interests include home projects, photography, watching movies, traveling, camping and boating.